Cratejoy is a fantastic marketplace with a collection of your favorite subscription boxes (and more that you may not even know about) all on one site! With sorted categories and a convenient search bar, it's not hard to find the kind of box you're looking for in seconds. Even more so, if you're a small business wanting to get your feet off the ground and running, I have three words for you: Subscription box marketplace. As a small business owner, you can easily and securely start your very own subscription boxes utilizing Cratejoy. It makes reaching thousands of potential customers a cinch! You might remember Mystic Muse from a previous review. 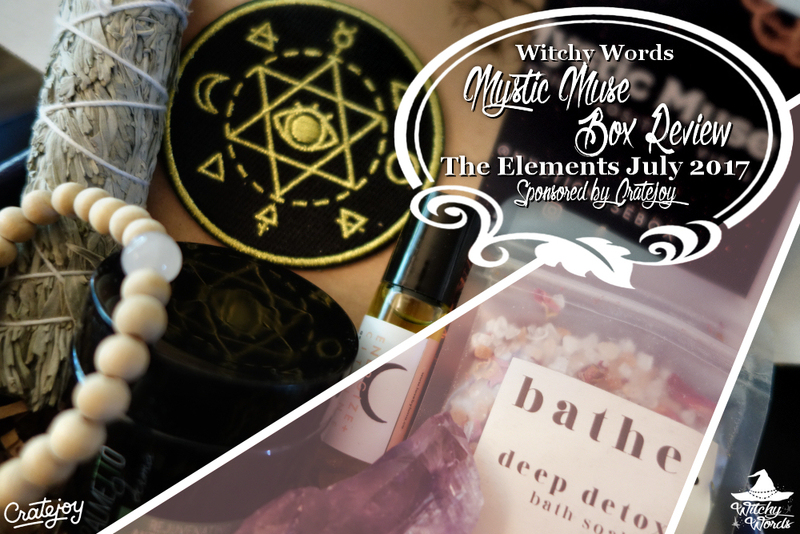 Newly created, Mystic Muse aimed to be a witchy self-care box for the soul. While it contained a selection of self-care items, one of the biggest concerns was the value of the box. At $45 a box, Mystic Muse is one of the pricier boxes out there. In the last box, I noted that the contents didn't seem to equate the price. The creators at Mystic Muse has heard customer concerns and took it very seriously. They reached out to Karen to see if I would be interested in reviewing their next box after making some changes! I have to say, a box that listens is remarkable. Huge points in my book! So let's see what's new with Mystic Muse! The first notable difference is the inclusion of the market value of each product in their pamphlet. I appreciated this greatly as it helps you see the potential savings you're earning through the box. The second is the theme. Each product is labeled as coming from one of the elements with the exception of two. This overall theme expands into a cohesive self-care ritual that I was certainly excited to try! I have to give credit where credit is due with this California Blue Sage Bundle from Mystic Muse: They call it a bundle and not a smudge stick I find that most boxes still call these bundles of herbs smudge sticks, which wreaks of cultural appropriation. I'm highly impressed! Sage bundles are great to sweep away the negative inner muck we gather on our soul or in our house. Start by cleansing your surroundings or yourself! Mystic Muse values this bundle at $5. Next, take a relaxing soak with this Deep Detox Bath Soak by Goodnight Darling Co. Pink Himalayan and dead sea salt blended with eucalyptus and lavender oils and accented by rose petals makes this a comforting bath. It smells absolutely wonderful! Both online and pamphlet states that this is worth $5.50. While you're soaking, why not try this Rejuvenating Antioxidant Mask by Palmetto Derma. This mask is 100% vegan and cruelty free, plus travel sized for your convenience. Containing peptides, kaolin clay, glycolic acid, hyaluronic acid and more, the mask will create a cooling, tingling effect when applied. This is valued at a whopping $64. Online research tells me it's currently on sale at $40. Even at $40, this mask is easily worth the majority of the box! While enjoying your soak and mask, give this beautiful raw amethyst a charge. Valued at $4 by Mystic Muse, amethyst is great for the soul and spirituality. Use this charged point when you feel exhausted spiritually to recharge later on! In the last box, I received a solstice pin. In this box, they included an alchemy patch. I greatly enjoy this touch to the box. Something I can enchant and wear that is specifically witchcraft themed is absolutely what I'm looking for from a witchcraft themed box. Mystic Muse values this patch at $10. Speaking of enchanting and wearing, this month's Mystic Muse box included a diffuser bracelet by Katie Leigh. Set with white onyx, adding a few drops of your favorite essential oil away from the skin allows you carry that scent with you throughout the day. According to the pamphlet, this bracelet is valued at $8. With research, the cheapest I could find this specific bracelet by this creator is $12 - so the pamphlet is even undervaluing the product. If you don't have an essential oil you want to use, why not use what the box comes with? 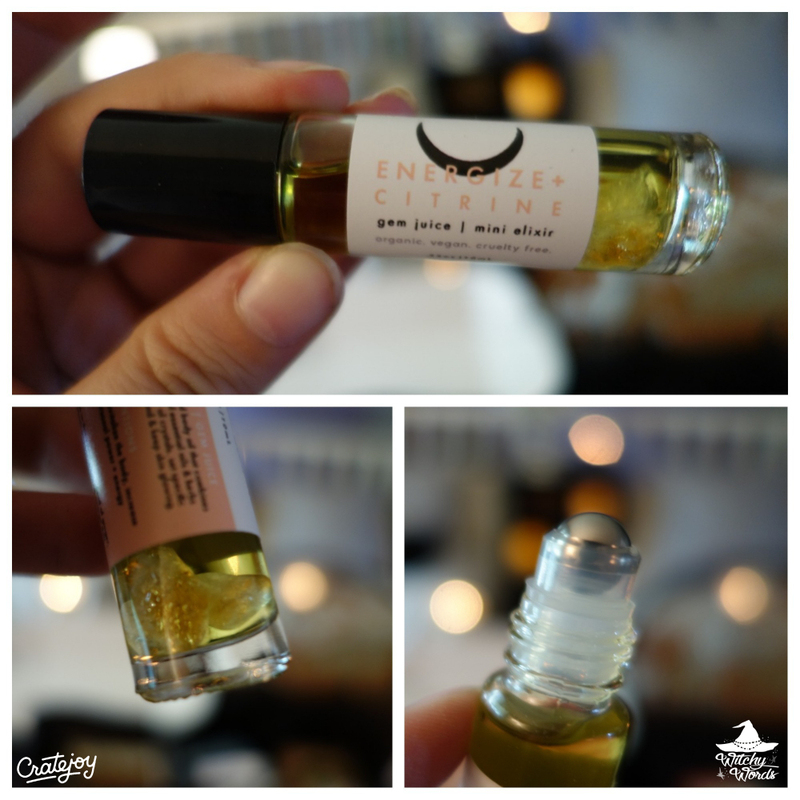 In this case, it's Energize + Citrine Gem Juice by Love by Luna. Containing zesty scents like ginger, black pepper and blood orange, this roll-on elixir is ready to use! Bonus: My message therapist circlemate Amy gives it her seal of approval. According to both online and the pamphlet, this item is valued at $16. Overall, I was incredibly impressed with the changes made to this box! The creators truly went above and beyond in listening to the concerns of their customers. Let's talk about the pros and cons! The information pamphlet is officially everything I want from subscription boxes. It includes the items inside, how to use them, where they come from and how much they're valued at! I did notice a typo on the antioxidant mask ("antioxidnt"), but it didn't distract from the information the pamphlet offers. Again, I can't get enough of the design of this box. The box and pamphlet and the box itself are incredibly well designed and of quality material. I love the consistent theme between the box's design and the pamphlet. Wonderfully themed and branded work! I think the reason I was on the fence about the theme last month is that the box neglected to include more interactive products. Last month, I could burn a candle and drink some tea. This month, I can cleanse my space, take a bath and put on a face mask. Then I can utilize the other items to upkeep the self-care theme. I'm also greatly pleased with the cohesion this box offers this month. Everything works together very well! Last time, I listed the price as a negative. This time, I'm listing it as a positive! Overall, this box was valued at a whopping $112.50. Even if you felt like the mask currently being on sale drops the price, it would still bring the value to $88.50, which is nearly double the price of the box. The biggest concern I had about this box is that it was somehow taped on a side that didn't open - meaning the opening to the box was not sealed during shipping. I still received everything safe and sound, thankfully. However, it could have been a huge issue if the box had opened or been carried by less careful handlers. Creators listening to criticism certainly goes a long way in my book. Thank you so much, Lauren!